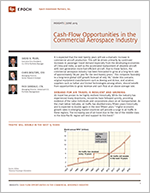 Cash-Flow Opportunities in the Commercial Aerospace Industry - Epoch Investment Partners, Inc. It is expected that the next twenty years will see a dramatic increase in commercial aircraft production. This will be driven primarily by continued increases in passenger travel demand especially from the developing economies of China and India, as well as the accelerated replacement of obsolete aircraft with next generation more fuel-efficient aircraft. Due to these factors, the commercial aerospace industry has been forecasted to grow at a long-term rate of approximately 5% per year for the next twenty years.1 This compares favorably to a long-term global GDP growth forecast of only 3%.2 Under this scenario, original equipment manufacturers such as Boeing and Airbus, and aviation suppliers such as Safran and United Technologies among others, should benefit from opportunities to grow revenue and cash flow at an above-average rate. Current forecasts suggest that the size of the world’s aircraft fleet will need to double by 2032 in order to meet future demand based on the factors previously highlighted.7 A strong production cycle should provide commercial aerospace manufacturers and suppliers with above-average growth opportunities over the long term. $502 billion representing over seven years of segment sales.8 As a result, forward visibility on revenue and cash flow for Boeing is far superior to many defense industry peers. conclusion from an investment perspective. For example, based on our own analysis Boeing’s stock is currently attractive on a free-cash-flow basis, but less so based on accounting-related earnings forecast. The commercial aerospace industry is poised to benefit for many years from favorable demographic trends and the demand for more fuel-efficient aircraft. These factors should enable the industry to grow at a faster rate than the global economy as a whole, providing investors with an attractive opportunity. In order to capitalize on this opportunity investors should focus on those companies within the aerospace and defense sector that will be in a position to grow free cash flow at an above-average rate and subsequently allocate that cash flow for the benefit of shareholders. 1Boeing, Current market Outlook (2014-2033), September 2014, http://www.boeing.com/assets/pdf/commercial/cmo/pdf/Boeing_Current_Market_Outlook_2014.pdf. 2OECD, Economics Department Policy Note No. 15, Looking to 2060: A Global Vision of Long-Term Growth, November 2012, http://OECD.org/economy/outlook/2060policynote.pdf. 5Boeing, Current market Outlook (2014-2033), September 2014.